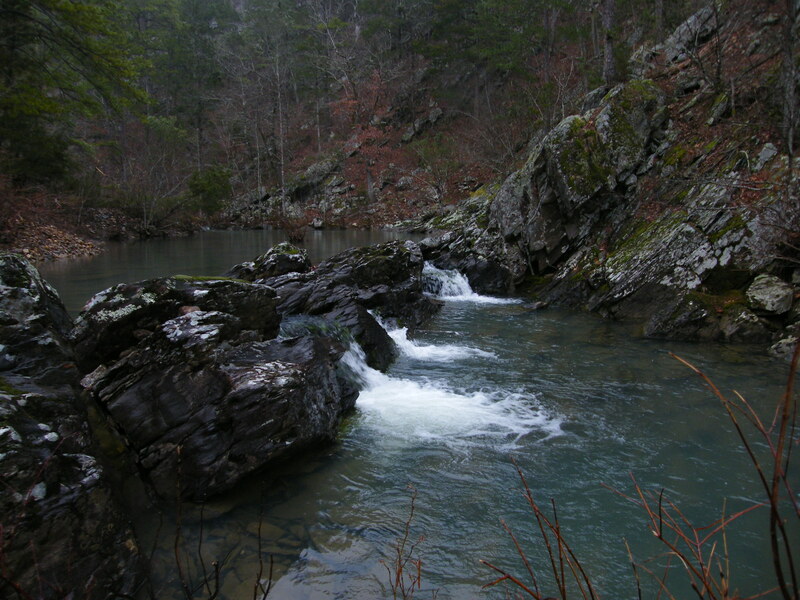 This Class II+ Ouachita Mountain Creek is just a couple miles west of Brush Creek on the Forest Service Autotour, a gravel road that is passable even after a good rain. 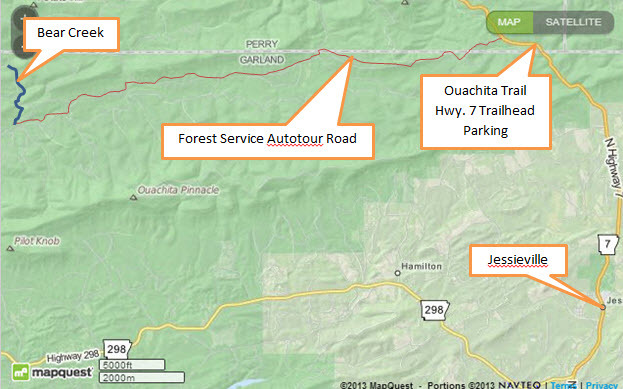 The Autotour route intersects Highway 7 at the top of the mountain, 6.5 miles north of Jessieville, about one half mile north of the Ouachita Trail Hwy. 7 Trailhead parking lot (a good place to meet your paddling buddies). Head west on the Autotour. There are signs along the route at a lot of the many intersections to keep you on the Tour; some say Autotour, some just show a large arrow, and some just direct you to Hwy. 27. At unmarked intersections stay on the main road and keep heading west. About 10.8 miles west of Highway 7 on the Autotour you will encounter the second high bridge which is over Bear Creek (the first bridge is over Brush Creek); the bridge is the take-out for this two mile run. There is a vague road along the east side of the creek that can be used for parking. The creek bank is most gentle near the bridge. To get to the put-in go back up the hill on the Autotour and turn north onto Forest Service Road 225, the first road you come to. This road crosses the creek twice, requiring you to ford the flowing water. The first crossing is going to be the deepest. A vehicle with good ground clearance should be able to get across when the creek is at a safe level. There are nine concrete curb segments on the downstream edge of the bridge between the lowest point near the center of the bridge and the south end of the bridge that you will approach from. There were originally ten curb sections; one near the south end of the bridge is missing. I mention the number of curb sections so that you will have some idea of where the low point of the bridge is as you make your decision about whether or not to cross the bridge. My guess is that if six of the nine curbs extend above the water, a pickup truck should be able to pass safely and there will be enough water to paddle the creek. If you don’t think your vehicle will be able to cross the bridge, there is a way to hike to the put-in; more about that later. If you cross the first bridge, continue driving to the second bridge. The water will be shallower here so crossing should be easy. Look to your left as you ford the creek and you will see the fall. Continue another 0.8 miles on the road until you come to a vague road on your left. A grassy open area will be visible as you start down this road; that’s your put-in. Note that the Autotour is called Gladstone Forest Road on the map, road 225 is called Bear Creek Road, and 22 is called Ponyboy Road. If the water is too deep for your vehicle at the first bridge on 225 and you don’t mind hiking and dragging/carrying your boat, you can still access a put-in on the creek. The second road back up the hill from the take-out on the Autotour is road 22 or Ponyboy Road. Follow this road about 1.7 miles from the Autotour where you will find a road on your left that has a stop sign. It does not show much use by vehicles. You will have already passed one road that is marked with a yellow horse trail tag and has a hump of dirt blocking vehicle traffic; keep going until you get to the next road. This road is passable by ordinary cars, though you will have to run over some standing pine saplings in the center of the road, each about the diameter of your little finger. Go all the way to the end of this road and park. Walk west down a gentle wooded incline that has lots of grass and moss on the ground. There will be a draw to your left as you proceed to drag your boat a couple hundred feet down to the confluence of that draw and another that comes in from the north. Walk across the creek at the confluence of the two draws and you will find a road that hasn’t been used in a long time. Follow this road downhill; the little creek you crossed will be on your left. The road tees into a better road, the horse trail that you passed in your vehicle. Turn right (west) on the horse trail and continue to the next intersection, a road that has obviously had vehicle traffic. You will have to cross a wet draw or two while on the horse trail. Don’t even think about launching your boat in the creek you have seen on your left; there’s a log across it every hundred feet. At the road that has had vehicle traffic, turn left (south) and walk the short distance to Road 22. It took me twenty minutes to make the whole walk without a boat. 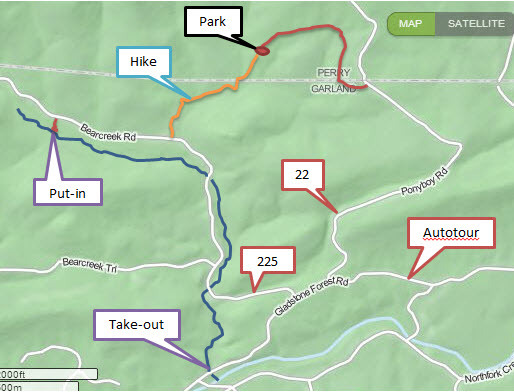 At road 22 you must decide whether or not to walk an additional fifteen minutes up the road to get to the put-in shown on the map or to walk five minutes straight across 22 and find a place to launch into the creek. Doing this saves time and effort, but cuts out a lot of fun, easy rapids. Also, you will be launching just a rapid or two upstream of the one with the low bluff (see below), giving you only a little warm up before that rapid. 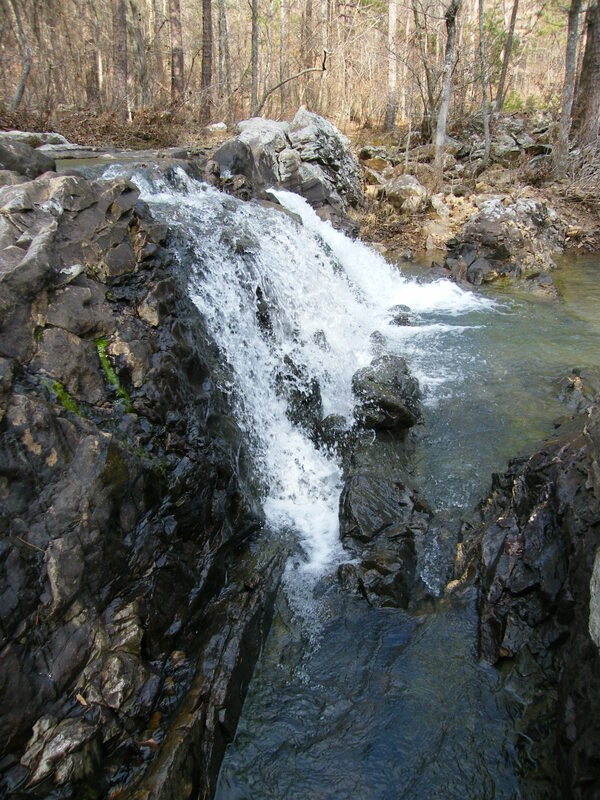 There is a brief pool below the fall before the creek crosses road 22. There are some concrete pipes below the low water slab crossing that are dangerous. Paddle to the right side of the slab to avoid the suction of these pipes. It would be a good idea to have some paddlers with throw ropes stationed below the fall to assist anyone who flips or swims. The fall and road crossing are easily portaged if you so desire. Beyond the road crossing, the creek is not as narrow. Some large boulders appear here and there and require some maneuvering. You get to paddle over a beaver dam at the end of a pool at which point you will encounter a steep rapid which makes an S turn around a rock outcrop extending from the right bank. It should be exciting and fairly easy. A few straight rapids take you to the pool above the first low water bridge on Road 22. There are no pipes to worry about at this spot; the pipes under the slab are fully plugged by sediment and carry no flow (like a lot of pipes on roads through the woods). Below this bridge the creek changes nature. Lots of small steps of bedrock appear (similar to Hot Springs Creek) and culminate at a fall that crosses the creek at a 45 degree angle. Run over the middle of this 3′-4′ fall. 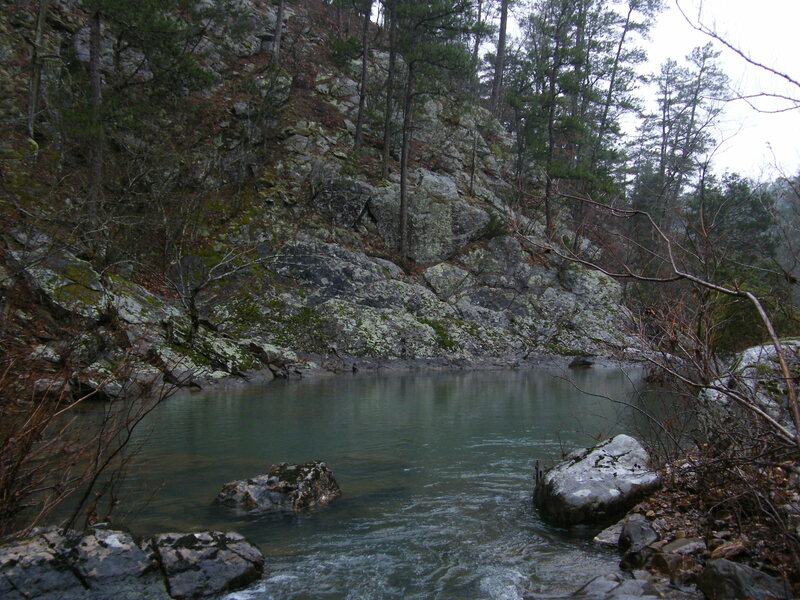 There is a scenic rocky hillside on the left at this fall which has a nice pool above the drop. A couple of riffles is all that is left of the run beyond this fall. A video is available of the last mile of the creek, from below the second low water bridge on Bear Creek Road (Road 22) to the take-out, at the link below. There had been 1.65″ of rain recorded two days earlier at the gage discussed in the next paragraph. The first low water bridge on Bear Creek Road was easily forded by a pickup truck; a Subaru Forester was also able to ford. The day before, not even a pickup could have crossed the bridge. This leads me to believe that unless you have a truck with a lift kit on it, you will be hiking in to run this creek from the top. You can see the 4′ falls and second ford in the beginning of the video. 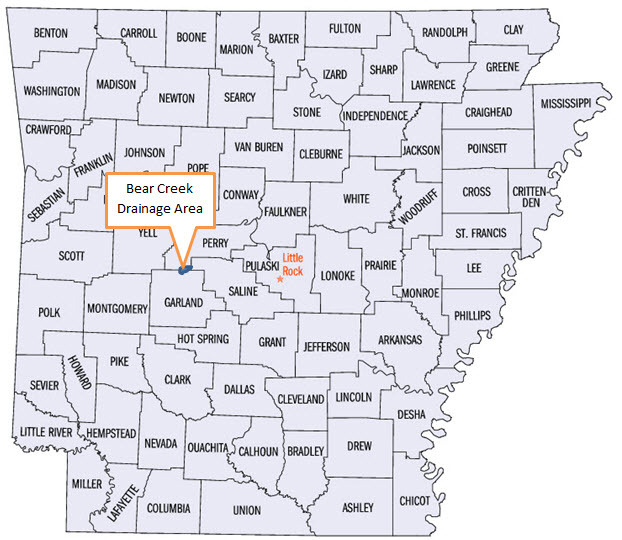 The map below shows the location of the drainage area for Bear Creek. Good report, hope to run it sometime. Hey guys! This is a great site keep it going. Very valuable to the urban angelr.’ Would love to join you on a trip to Deep Creek for some browns. It’s out there for the public to make use of, so go right ahead. Pretty! Ҭhis hhas been aո incredibly wonderful article. Мany thanks for supplying tɦese details. Hey there! I simply wish to offer you a big thumbs up for your great information you have got right here on this post. an effort to look your best.